I'll be preaching about Queen Esther this coming Sunday. Most likely I'll be borrowing part of the title of Karol Jackowski's article, Holy Disobedience in Esther. I love the idea/reality of Holy Disobedience so that will likely be my title. However, I keep coming back to Queen Vashti. She was also a heroine, without her would Esther have had the courage to approach the king? Queen Vashti, like the legend of Adam's first wife, Lilith, does not bend to the whims of men. She is her own woman and will not be subject to their drunken and abusive requests. One of the texts I read today (I can tell you the title tomorrow when I get back to the office) talked about how it was Vashti's death that made the king more ready to accept Esther as she approached him without an invitation. Perhaps after experiencing the death of Vashti, he did not want Esther to suffer a similiar fate and was ready to accept her approach. 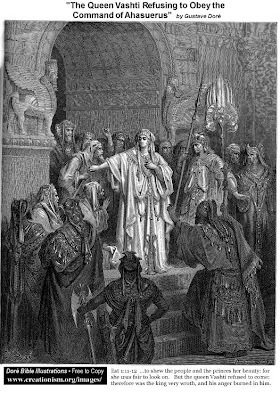 Perhaps Vashti also inspired Esther to approach the king at the risk of her life. Yes, Mordecai was persuasive about saving her people but in addition she could draw from Vashti's bravery in saying no to the king. If Vashti could stand up for herself and herself alone, risking death for her own dignity, then of course Esther could risk death not only for herself but for her people. Today, as I reread Esther, I was in awe of Vashti. I thought, perhaps my next tattoo should be of Vashti. Perhaps she, like Mary Magdalene, she would give me strength and courage when I needed it. Perhaps she could remind me to be strong in the face of great opposition and danger. Does that pass over into the land of idolatry?